The Standard PF-P280 Folder is designed to produce one fold quickly and cleanly at a very economical price. This machine can fold up to 190 sheets per minute on half folds which adds up to 11,400 over the course of an hour. The PF-P280 can also produce letter folds, Z-folds, or 3 other folds via a second pass. This paper folder accepts paper sizes of 5.5”x 8” (half-letter), 8.5”x 11” (letter), 8.5” x 14”(legal), and 11”x 17” (tabloid) which is great for all your folding needs. The PF-P280 is ideal for churches, non-profits, schools, or anyone with a tight budget. 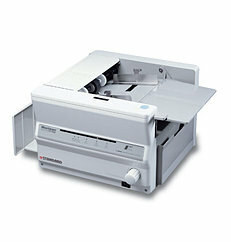 This machine is a perfect fit for folding newsletters, programs, newsletters, mailers, etc. However, this folder does not work with glossy paper, in which case you would need a different machine. The Standard PF-P280 Folder is fast, easy and economical and features a reliable feed system. The fold feed rollers are easily accessed and can be removed for cleaning without the need for extra tools. This folder has a single fold plate that is horizontally positioned under the feed table to reduce machine noise and minimize space requirements. Since the PF-P280 is only 19″ x 18″ x 13″and weighs 64 pounds this small, compact, quiet machine can fit on almost any table top. If you have any questions or are interested in purchasing the PF-P280 Paper Folder, visit us at SpiralBinding.com. We have great pricing on a full line of Friction Feed Paper Folders. Call us at 1-800-631-3572 for more information!